Below are specific findings about news media attitudes and habits in Sweden. The findings come from a Pew Research Center survey about news media and politics across eight Western European countries conducted from Oct. 30 to Dec. 20, 2017. The survey covered five countries in the north (Denmark, Germany, the Netherlands, Sweden and the United Kingdom) and three in the south (France, Italy and Spain). The sense of importance of and trust in the news media vary considerably by country. 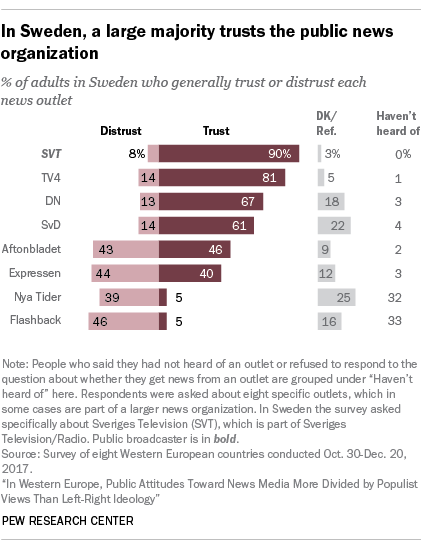 In general, adults in northern European countries – for example, Sweden and Germany – are more likely to say the news media are very important and that they trust the news media, while people in France and Italy are the least likely to say this. In Sweden, the majority of adults (61%) consider the news media very important to society. About the same portion (64%) say they trust the news media. This includes 12% who say they trust the news media a lot. In most of the countries surveyed, people who hold populist views are less likely to say the news media are important and to trust the news media than people who don’t hold populist views. In general, the differences in these attitudes about the news media are small when comparing between people on the left and right of the ideological spectrum. 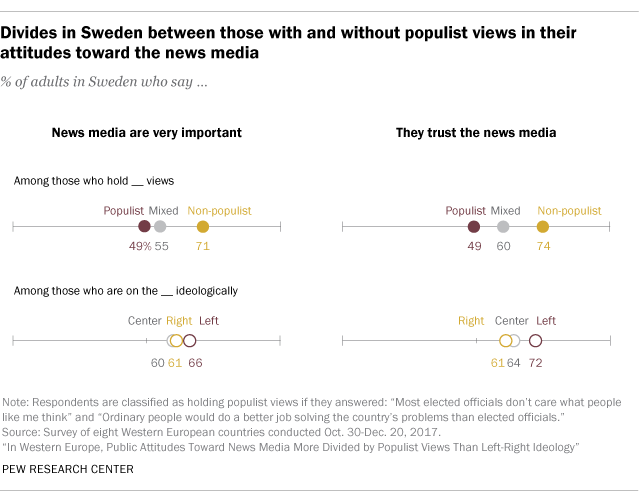 Populist divides in media attitudes are strong in Sweden as well: 49% of those with populist views say the news media are very important for society in Sweden, compared with 71% of those with non-populist views. On the question of trust, 49% of people with populist views say they trust the news media, compared with 74% of those without populist views. When it comes to the news sources people say they turn to most frequently, the divides between adults with and without populist leanings are not as strong as those seen for attitudes about the news media more generally. And in the southern countries, there tend to be larger divides in main news source preference between people on the left and right of the ideological spectrum than between those with and without populist views. 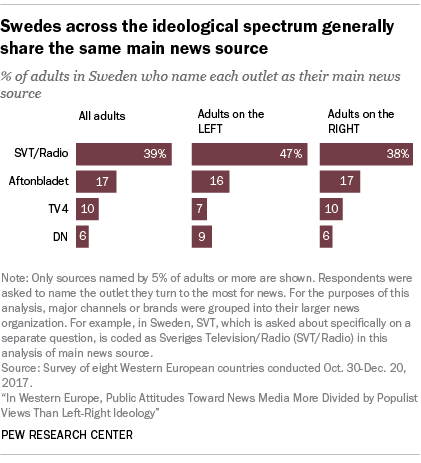 In Sweden, people on both sides of the left-right ideological spectrum are most likely to name Sveriges Television/Radio (SVT/Radio) as their main source, followed by Aftonbladet. For many of the news outlets across the eight countries, people who use an outlet to get news tend to think the outlet is closer to their own left-right ideological position. In Sweden, this is true for one outlet asked about: SVT. For this outlet, news users on the right place it closer to their own ideology. For four news outlets – TV4, Aftonbladet, Dagens Nyheter (DN) and Svenska Dagbladet (SvD) – right-aligned and left-aligned news users agree on their left-right placement. One outlet in Sweden, Expressen, follows a unique pattern: right-aligned users are more likely to place the outlet on the left than left-aligned users. Flashback and Nya Tider are not included in this analysis, because they did not have a large enough sample of left or right users to analyze. In general, where the public places an outlet tends to differ from where the average audience actually sits ideologically. For each of the news outlets asked about in the survey, the average audience (based on self-reported usage) tends to fall near the ideological center. People who have heard of each outlet, however, tend to place the outlet either farther to the left or farther to the right than the actual ideological position of the outlet’s audience. In Sweden, most of the outlets studied follow this pattern. In many cases, while the outlet’s news audience is near the center, people who have heard of the outlet tend to think it leans slightly more to the right or left. 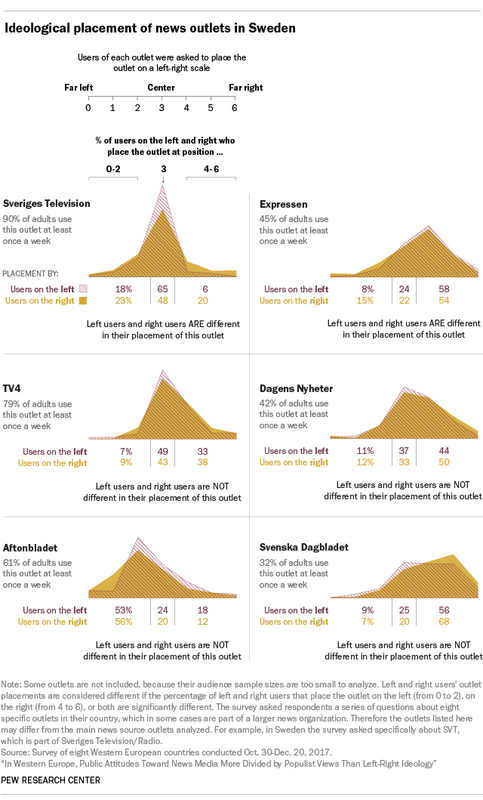 Svenska Dagbladet, for example, has an audience that sits at about the middle of the left-right spectrum (3.5 on the 0-to-6 scale), but when asked to place the outlet on the same left-right scale, people who have heard of SvD place it farther to the right (at 4.1). In seven of the eight countries surveyed, the most trusted news outlet asked about is the public news organization in each country. In Sweden, an overwhelming majority (90%) say they trust the public broadcaster SVT, followed by 81% who say they trust the private broadcaster TV4. As with trust in the news media generally, trust in specific outlets varies by populist leanings, with those who hold populist views expressing lower levels of trust than those who don’t. In Sweden, populist views relate to trust in most outlets studied, but left-right ideology is not a key driver. For example, those with populist views are 26 percentage points less likely than those with non-populist views to say they trust Dagens Nyheter. When it comes to left-right ideological differences, though, there are divides for only three outlets (SVT, Aftonbladet and Nya Tider), and they are generally smaller in magnitude than the divides based on populist views. Many people in Western Europe get news through social media, with Facebook cited as the most widely used platform for news. 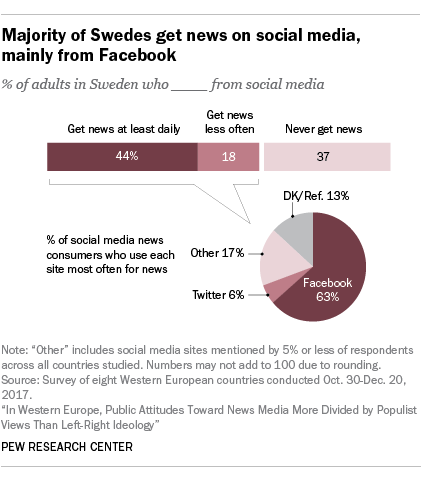 A majority of adults in Sweden (62%) get news on social media, including 44% who get news on social media daily. Facebook is the most common social network used for news: 63% of social media news consumers use it most often. In Sweden, young people (those 18 to 29 years old) are more likely to get news on social media daily than those 50 and older (68% vs. 31%). About half or more social media news consumers in each of the eight countries surveyed say they are familiar with the sources they see on social media. Still, sizeable minorities say they typically do not pay attention to the source of the news they encounter there. 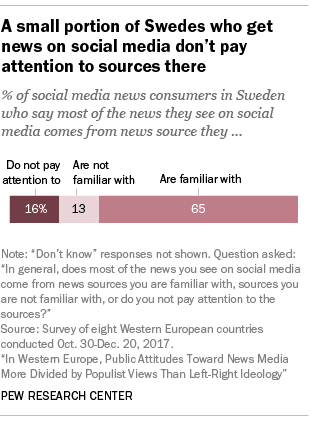 Social media news consumers in Sweden are similar to other Western Europeans – 65% are familiar with the news sources they find on social media, while 16% do not pay attention to the sources there.